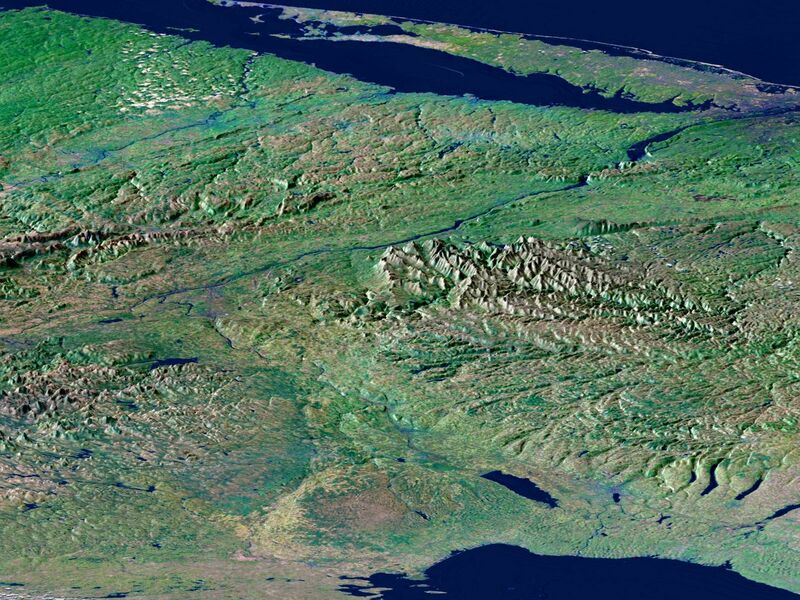 From Lake Ontario and the St. Lawrence River (at the bottom of the image) and extending to Long Island (at the top), this perspective view shows the varied topography of eastern New York State and parts of Massachusetts, Connecticut, Pennsylvania, New Jersey and Rhode Island. 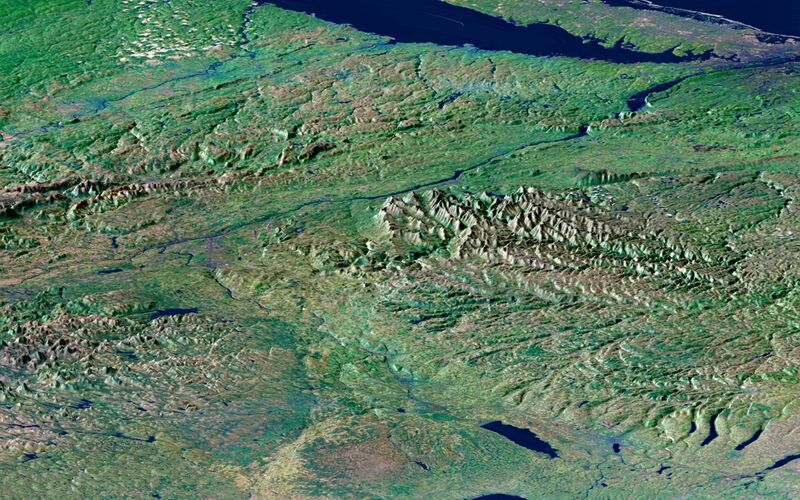 The high "bumpy" area in the left foreground is the southern and western Adirondack Mountains, a deeply eroded landscape that includes the oldest rocks in the eastern United States. 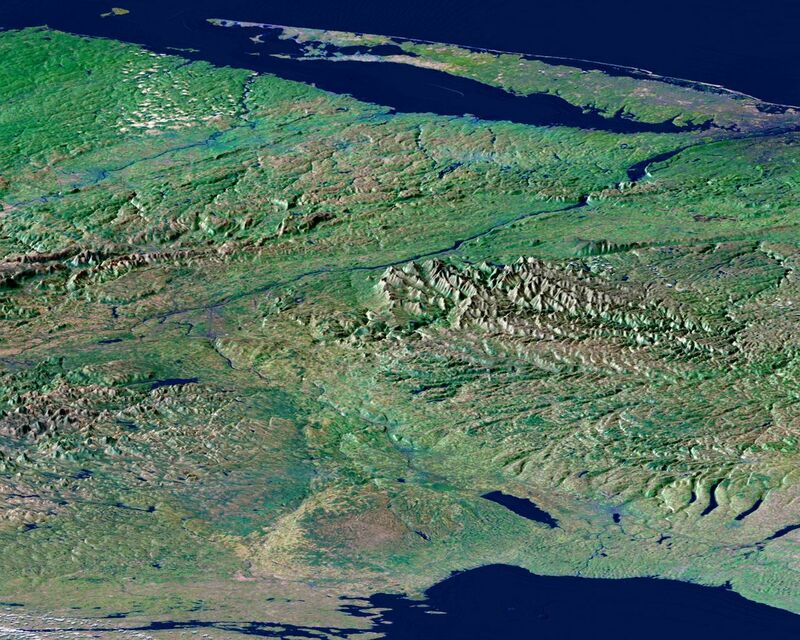 On the right side are the Catskill Mountains, a part of the Appalachian Mountain chain, where river erosion has produced an intricate pattern of valleys. Between the Adirondacks and Catskills, A wide valley contains the Mohawk River and the Erie Canal. 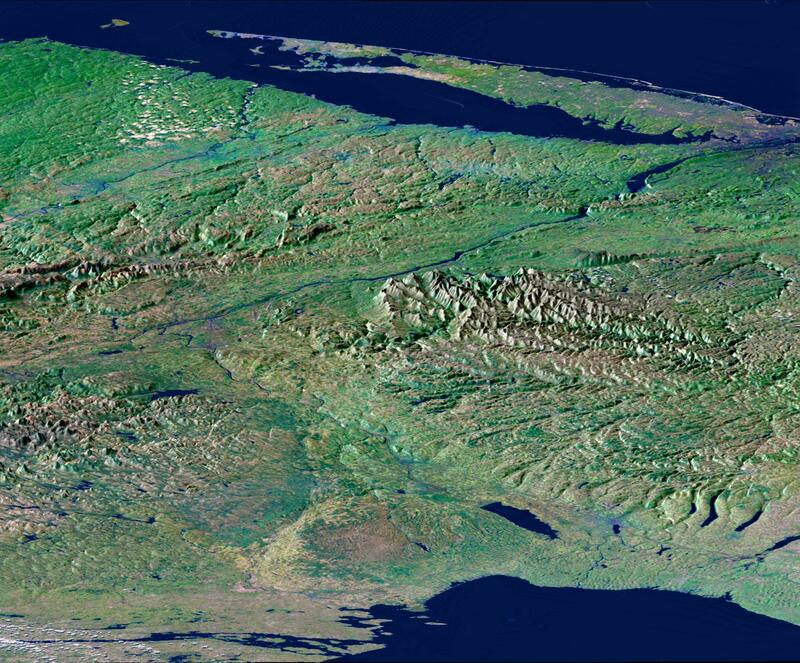 To the northwest (lower right) of the Catskills are the Finger Lakes of central New York . They were carved by the vast glacier that covered this entire area as recently as 18,000 years ago. The Hudson River runs along a straight valley from left center (near Glens Falls), widening out as it approaches New York City at the upper right on the image. The Connecticut River valley has a similar north-south trend further to the east (across the upper left corner of the image). The Berkshire Hills are between the Hudson and Connecticut valleys. This image was generated using a single swath of data acquired in 68 seconds by SRTM and an enhanced false-color mosaic of images from the Landsat 5 satellite. Lush vegetation appears green, water appears dark blue, and cities are generally light blue. White clouds occur in the upper left and lower left. Topographic shading in the image was enhanced with false shading derived from the elevation model. Topographic expression is exaggerated 5X.